A new pilot study published in Military Medicine shows that Iraq and Afghanistan veterans experienced a 50% drop in PTSD symptoms by the 4th week of Transcendental Meditation practice, and even greater improvements by two months and three months. The study, titled “Effects of Transcendental Meditation (TM) in Veterans of Operation Enduring Freedom (OEF) and Operation Iraqi Freedom (OIF) with Posttraumatic Stress Disorder (PTSD): A Pilot Study,” is summarized in the new book The Resilient Warrior: Healing the Hidden Wounds of War (2011) by author Jerry Yellin with Dr. Sarina Grosswald. Dr. Grosswald was interviewed about PTSD and this study on the program The Simplest Ways. 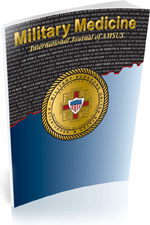 Publisher: AMSUS – Association of Military Surgeons of the U.S. The article is copyrighted by the journal. Click to read the abstract now. Dr. Rees’ picture, bio and links to other publications are available at the CAMS website. This entry was posted on Thursday, December 1st, 2011 at 12:08 pm	and is filed under Articles, News. Both comments and pings are currently closed.